Enjoy resort-style living in prestigious Newport Beach at this immaculate, contemporary oceanfront retreat. The high-end, family-friendly home is located DIRECTLY ON THE SAND, with no boardwalk and features three floors of endless ocean views. The comfortable 6-bedroom home sleeps 12-14 with 4 full bathrooms, making it perfect for executive retreats or family holidays. Parking for 4 cars. Relax on leather sectional facing a 55" flat-screen HDTV (satellite Direct TV service) with surround-sound and a Blu-Ray/DVD player. Prepare meals in a fully-furnished kitchen with granite countertops and breakfast bar. Two dining tables together seat up to 14. Also, grill or play cards on the spacious patio just steps from the surf. Beach chairs, towels, lounges, and umbrellas are provided to just sun bathe or catch a wave. An outdoor shower makes the post-beach clean-up a breeze. A private haven awaits upstairs in the master suite, with DirectTV HDTV, walk-in closet, king-size bed and ocean-view balcony. The lounge area features a beamed ceiling and floor-to-ceiling windows...it is the perfect spot to curl up with a good book or work at the computer desk (WIFI, copier, fax, printer and phone provided). The spa-like master bath offers a serene retreat, with jetted tub, walk-in shower and first-class amenities. All 6 bedrooms include ceiling fans, reading lights and large mirrored closets with built-ins (2 king beds, 4 queen beds, and a portable crib by request). A third-floor den converts, if needed, to a 7th bedroom with a queen-sized futon couch. A cozy children's hideaway with beanbag chairs and toys opens off the room, and TV cabinet is stocked with kid-friendly games and DVDs. The third-floor rooftop deck lets you bask in your lounge chairs at the stunning panorama of crashing waves and sparkling coastline, and at night offers a view of Disneyland's spectacular fireworks. We are located 5 minutes from top-rated Hoag Hospital, 10 minutes from world-class shopping at South Coast Plaza and 20 minutes from Disneyland Resort. Families, Couples and Corporate Retreats only. No smoking, please. A mother and daughter team own and have rented this home for over 15 years. Like any good family-owned business, customer service is their top priority. The location of this home is right on the Newport Beach sand, and in a prime location by 42nd Street. It is not located with the boardwalk in front of the home, so you can walk out of your patio and directly onto the sand. We are 1 mile from Hoag Hospital for those who undergo treatments. We have the most bedrooms and bathrooms of any oceanfront luxury rental home in Newport Beach. There are very few places in the world like this home, where you can sit on the patio or on the rooftop deck and have a clear view of the sun setting over the pacific. The master bedroom delivers the perfect beachfront get-away with breathtaking views of the Pacific. Relax in comfort in this elegant retreat featuring a king bed, spa-like master bath with jetted tub, gas fireplace, cozy reading nook and adjacent computer desk. This home has the unique combination of luxury and beachfront convenience. Hair dyers are in each bathroom. There is no finer beach in Southern California than Newport Beach. An amazing view from all three levels! Your patio is directly on the beach. The third floor deck has a breathtaking view! You can enjoy the ocean waves crashing in front of you. Two refrigerator/freezers: one in kitchen, and one in garage for extra food storage. Toaster and Toaster Oven provided. Full place settings for 14. Kitchen includes Keurig Coffee Maker, Drip Coffee Maker, Toaster Oven, Slow Cooker, Blender, Coffee Maker. We have three TVs, one is a 55" flat screen in the family room. Rooftop deck has an amazing 360 degree view! Included is a tankless water heater (instant hot water) and other high-end amenities for a comfortable stay. This house is well-maintained by the owners. It is obvious that they spend a good deal of time at the home and so it feels like a home away from home. It is well-appointed will all the necessities. Of course, it is right on the beach and it is so nice to have the privacy of a beach-front getaway without the multi-use trail in front of your doorstep so the kids can run right out to the sand without worrying about them getting trampled in the process. We highly recommend! Words can not express how fantastic this property is! Beauty on the Beach is exactly as it is described and pictured! This was the most relaxing vacation I have had in awhile! Our family had a wonderful time! We had people from age 9 months to 85 years old! The house has everything you need! We used Instacart to deliver our groceries! All you need to do is bring your swimsuit! There is beach chairs, umbrellas, boogie boards! They have thought of everything! Step right out onto the sand and head straight out to the ocean! We will definitely book this house again and I would highly recommend it for anyone to stay in! We are so pleased to know of your lovely experience at our home. We aim to please!! We really enjoyed the property. We have always stayed in houses that front the boardwalk and so this was a pleasant change to not have all that traffic passing in front of you all day along with having a very large front patio. The house suited our needs perfectly and the parking was also a bonus. Thank you for your kind compliments! We were happy you enjoyed our home. Wonderful location on the beach in Newport, right on the sand in the stretch where boogie boarding is allowed but surfing is not. Fully equipped with all the beach equipment we wanted. Close enough to walk to the grocery store, the pier, and shops and restaurants. And three different donut shops (if you rise early like me and enjoy and long walk on the beach with coffee and then stopping off to bring back donuts for the kids). The house itself was in great shape, exactly as advertised. We had a minor problem with AC/fans and the owner had repair folks out first thing the next morning which is really responsive. Would definitely stay again. Beautiful home in the perfect location! Fantastic experience! We will stay here every time going forward! It was our pleasure to have you as our guest. We look forward to your next Newport Beach adventure at our home. The home was very nice and very well maintained, and located perfectly on the beach. We would like to say thank you for the opportunity to stay in the home. Our only negative issue would be their was not enough bath towels for 14 people. We would stay in the home again if the opportunity came up and was available. We are glad you enjoyed your stay at our home and look forward to your return. Thank you for your feedback about the towel situation not being ideal. You mentioned you had 12 guests so we did not know you needed 14 towels. We would have been happy to bring more to you. Next visit, please feel free to call us; we live close by, and will do our best to make your stay comfortable. Newport Beach is one of the highest sought after beaches in Southern California. Beautiful sand and surf during the day, and a safe walk to the Pier at night. Multiple restaurants and services at your fingertips, with high quality shopping at South Coast Plaza and Fashion Island within a 10 minutes drive. 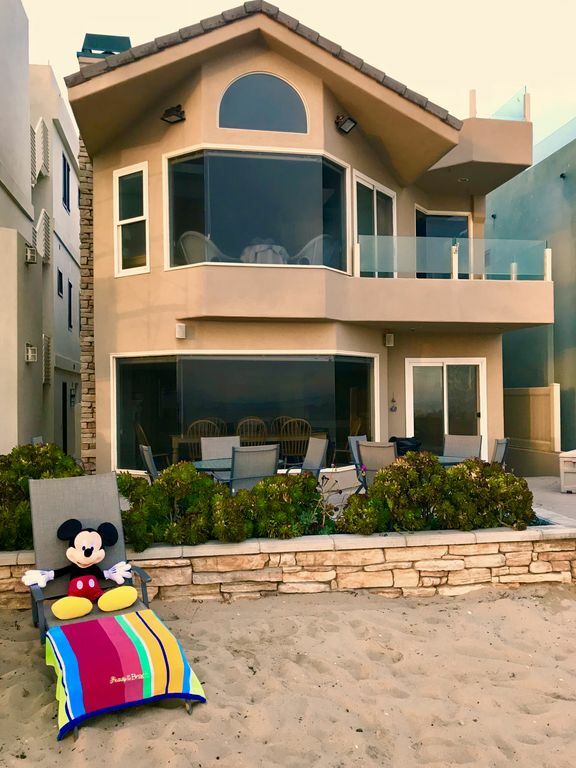 You can spend a day on the patio surfing or sunbathing, or drive 20 minutes to Disneyland!